Care homes and the NHS: The silent scandal? The plight of care home residents has pretty much slipped below the radar in recent years. While there is close scrutiny of everything from A&E waiting times to access to the latest cancer drugs, the support - or rather lack of it - care home residents receive from the NHS has gone almost unnoticed. But, on Monday morning, the issue bubbled to the surface following a front-page article by the Daily Mail headlined "GPs vote to axe care home visits". The fact is that care home residents and their families may well ask what's new - GPs have long since stopped visiting care homes. A quick review of the sector in 2012, by the Care Quality Commission, found most of the 81 care homes looked at were not receiving regular visits from GPs. And it is pretty safe to assume the situation hasn't improved. Think about that. These are among the frailest, most vulnerable members of society. Many are living with a complex range of conditions, including dementia, heart disease and diabetes, with residents on an average of nine medications each. And yet they are going without the sort of basic health care most take for granted. Like many problems not given the coverage they perhaps deserve, the issue has been developing gradually over time. The closure of long-stay NHS beds over the past 20 years or so has meant a cohort of needy, frail people have disappeared from view from the health service. Before they move into a home, these people will probably be among a GP's most frequent visitors. But when they enter a care home, their ability to get down to the local practice diminishes. They may even move out of the local area. And GPs, who argue they are struggling to cope with the day-to-day demands placed on them, quickly get consumed by the patients turning up at their door. What is the care-home sector? Find out more about care at the BBC's cost of care website. Use the BBC's care calculator to find out how much care costs where you live. This has caused many care home managers to take extreme measures. Faced with caring for residents with increasingly complex conditions, they've started paying retainers - sometimes topping £20,000 a year - to GPs to provide regular visits. 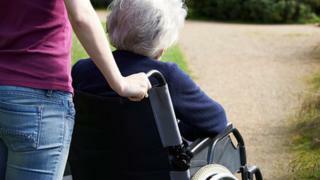 Care England, which represents providers, and charities such as Age UK have being trying to raise the alarm for some years. But, as care-home residents tend not to live that long once they reach the stage where they need round-the-clock care and given their extreme frailty, the human stories that often grab the attention are not always heard. There are signs things could be changing, however, and, as always, the driver is money. Care home residents are an estimated 50% more likely than the average older person to be admitted in an emergency to hospital. This costs the NHS money, and so health bosses have started looking at new ways to ensure they receive the health care they need. There are six pilot areas in NHS England's vanguard programme, looking at how GPs, specialist nurses and hospital doctors can work more closely with care homes. Ideas include extra GPs being taken on to provide regular "ward rounds" and hospital consultants running clinics either face to face or via digital technologies such as Skype. In fact, if you examine the detail behind Monday morning's story, GPs are actually calling for the responsibility for care home residents to become a distinct and separate part of their contract. That, of course, would require extra investment. And while some may be critical of GPs wanting more money, others are just happy to see the topic aired.